^ Thomas M. Kitts. Finding Fogerty: Interdisciplinary Readings of John Fogerty and Creedence Clearwater Revival. Rowman & Littlefield. 2012: 3. ISBN 978-0-7391-7485-2. ^ Stephen A. King. I’m Feeling the Blues Right Now: Blues Tourism in the Mississippi Delta. Univ. Press of Mississippi. 1 June 2011: 52. ISBN 978-1-61703-011-6. ^ Fortunate Son. snopes.com. July 14, 2014 [March 8, 2015]. ^ Creedence Clearwater Revival. Rockhall.com. [March 2, 2010]. ^ John Fogerty Explains CCR's Hall of Fame Meltdown. 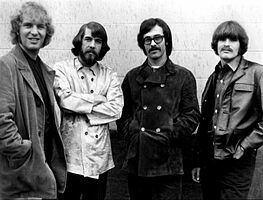 ^ 100 Greatest Artists: Creedence Clearwater Revival. Rolling Stone. [November 4, 2011]. （原始内容存档于October 16, 2011）.